Whether you relish in the crisp, white mornings, or shudder when you look out the window, winter is undeniably here. Full disclosure, I’m more of the relishing type, and after spending last winter studying Edmonton’s winter patios, I’m more excited for winter than ever before. There is SO MUCH untapped opportunity in our winter season, and winter patios are just a slice of the opportunity pie. Some of you may be thinking “What?! Winter patios…but patios are a summer thing!” It’s true – Edmontonians “patio hard” in warm weather, but there are so many reasons for us to keep calm, and patio on… even when the snow flies. It’s estimated North Americans live over 90% of their lives indoors, spending the highest percentage indoors in the winter. So much time spent in thermally regulated, indoor environments can result in thermal boredom. (A new problem you didn’t even know you had! Google it.) Increasing our outdoor activity is a great way to avoid thermal boredom, and has been shown to positively impact our physical and mental health. 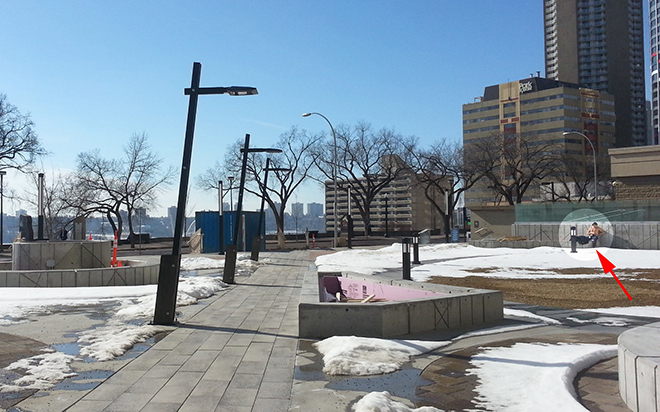 Of course, there are days where enjoying a winter patio isn’t a top priority (i.e a grey winter day with a wind chill of -50°C), but in sunny Edmonton, we have many calm, sun-filled winter days as well (see shirtless man below). These are the days to flock to our winter patios. Man sunbathing in Telus plaza. March 2016. Some industrious patio owners in our city are tapping into this, and serving up hot and fresh patios for our winter enjoyment. Café Bicyclette experiments with a new patio design every year, and hits many of the key features of a great winter patio. Their 2015 patio design included an open firepit, propane heaters and blankets to keep warm, as well as coniferous trees around the patio to protect patrons from the wind. 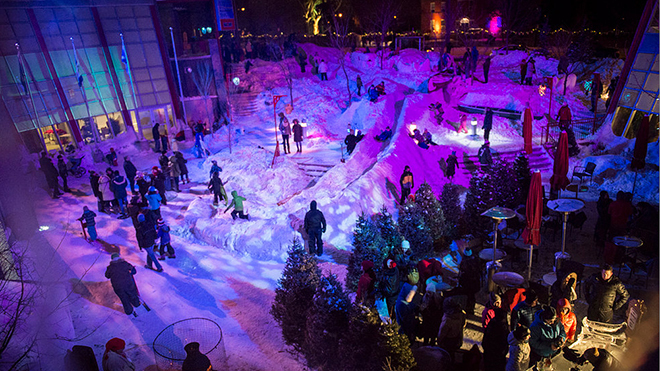 Cleared snow was transformed into a giant ice slide where kidlets could burn off steam as you sipped your hot toddy. Flying Canoë Volant festival at La Cité Francophone. Café Bicyclette patio is surrounded by coniferous trees for wind protection. A good winter patio (or sidewalk café) can be the simplest of things as well. At Wild Earth Café – tables, chairs, and a polar fleece blanket on the sun-filled sidewalk is invitation enough to sit and stay awhile. 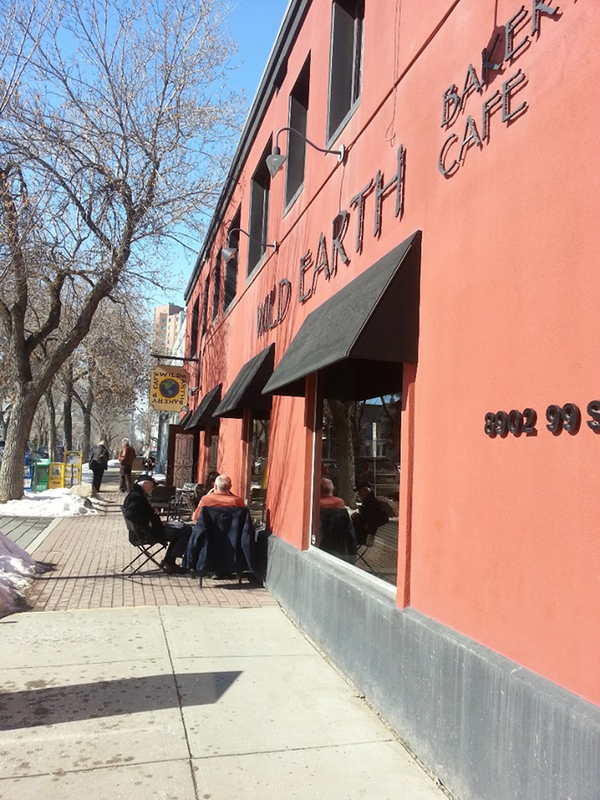 Wild Earth Cafe on a warm March day. As the old adage goes, getting there is half the fun. A sure-fire way to increase your vitamin O(utdoor) intake and combat thermal boredom is to pair a winter patio visit with active transportation. When we walk, bike, ski, jog …skip… to these spaces, we’re more likely to be dressed for the weather. Edmonton has a growing number of established winter patios to visit, but if there isn’t one close to you, don’t be afraid to ask for a chair at your local coffee shop and enjoy basking against that sunny wall. Patios occupy this magical, in-between space. On patios, indoor life meets outdoor, and street life meets private building space. They provide the best front row seats to watch street life unfold (Look! That freshly built snowman is being detailed by a poodle…) while sipping on a piping hot latte in your cushioned chair, out of the wind. Put thy thermal boredom in its place this winter, and get thee to a patio.